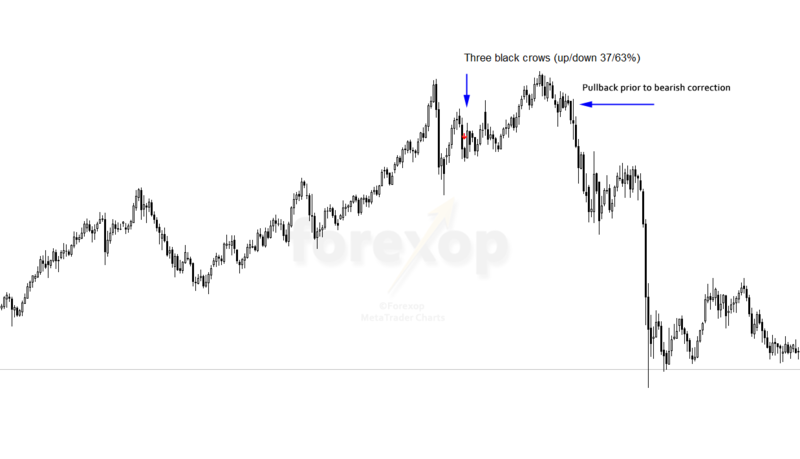 The three black crows is a bearish sign that an uptrend has reversed or is in the process of reversing. It appears in trend tops as well as in bear rallies. When a trend is turning there may be several signs and “three black crows” is often just a pointer. That said, trading the pattern when it appears in bear rallies is often easier and less risky than trying to time the turning point of a major trend. The pattern is identified as three black candlesticks in a row with each having descending open and close prices. That means for a valid signal, the open price of each candlestick should be lower than the last open and the close should be lower than the close of the last. As well the pattern should appear at or near a chart top so that the first bar makes a recent high. It’s worth remembering that three black crows can appear in either bullish or bearish trends. In a bearish trend the pattern will often appear in short upswings or bearish rallies. With forex charts as with other round-the-clock markets the close of one bar will usually level at the open of the next bar unless the bars are split over a weekend or holiday. With stock charts there can be large gaps between the opens and closes where the market has closed overnight or over a weekend for example. 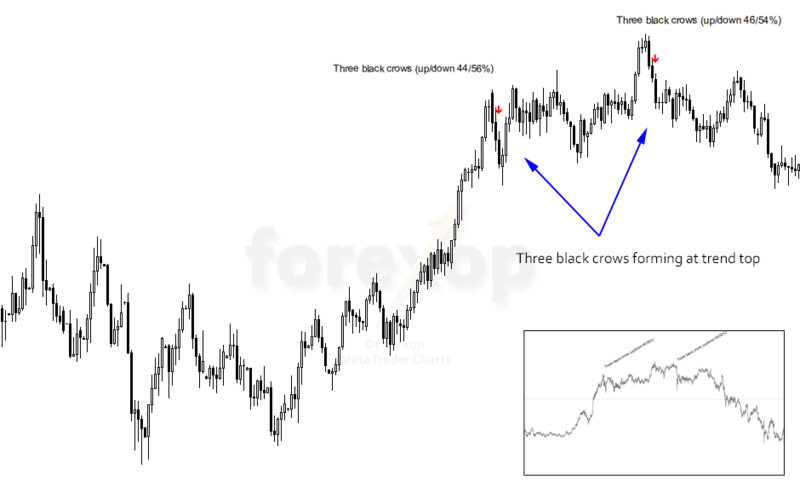 Since a “3-black crows” is as a rule a bearish signal, traders will normally use it as an opportunity to short the market or unload long positions. It’s also favored by swing traders as a signal to enter short positions into a market that’s already trending down. 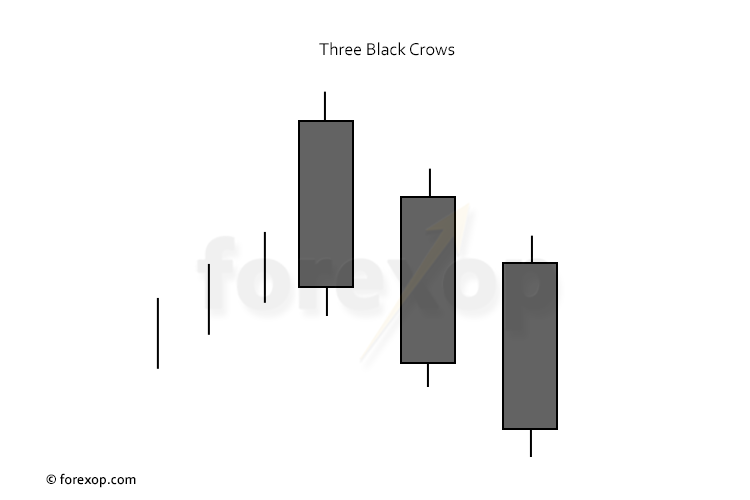 This happens for example when a short upswing ends in a “three black crows” correction as demonstrated in the chart in Figure 2 below. This example shows GBP/USD in a downward trend but a bear rally takes hold and this starts to recover some of the fall. We then see a “shooting star” candle forming and this is immediately followed by a three-black-crows formation. The shooting star candle makes a new recent high and this implies a short-term top could be forming. The three-black-crows pattern then follows as the price begins to fall. We then see the bearish trend resume after the patterns complete. On its own this 3-crows pattern only indicates a 51% probability of a price fall. But since there are other confirming reasons, such as the shooting star, and the established downtrend we can consider those as well. With the presense of a fourth candlestick which is bullish, the three black crows can extend into a bearish three line strike. The text book description of this pattern is when it indicates the turning of a bullish rally. In these setups we often look for other flags to confirm that a trend may be turning, and the three black crows can be just one of them. Figure 3 shows a snapshot of the USD/JPY daily chart. In this example there’s a strong bullish trend that’s carried the price up to new highs. We see a steep upwards move and this is immediately followed by a bearish correction. The market is already looking overbought at this time. This is the point that the first bearish pattern appears. It’s marked on the chart with the first blue arrow. As with most trends we see a rise in volatility as the market absorbs the new price levels and the direction is unclear. After the pause, the market then rallies again and a second, higher peak starts to develop. Again this peak corrects downwards and that’s marked with a second three-black crows pattern. At this point a bearish reversal looks to be the most likely course of the market. The trend does in fact start to turn downwards. 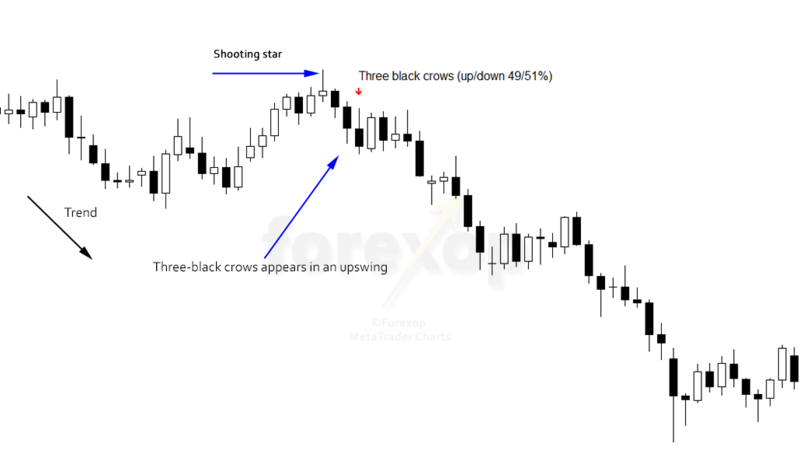 In this example the two 3-black-crows patterns indicate a strong chance of a downward correction at 56% and 54% respectively. In hindsight we can see that the top of the chart is forming into a head and shoulder pattern – a characteristic bearish reversal. One of the main problems with reversal signals is handling situations where the market pulls back in the other direction. That happens in cases where a false trend top forms but the market starts to rally up again immediately afterwards. Even when using other confirming signals there isn’t any magic bullet to completely solve this problem. That means we have to prepare for some increased volatility when entering the market at tops by placing appropriate stop losses. 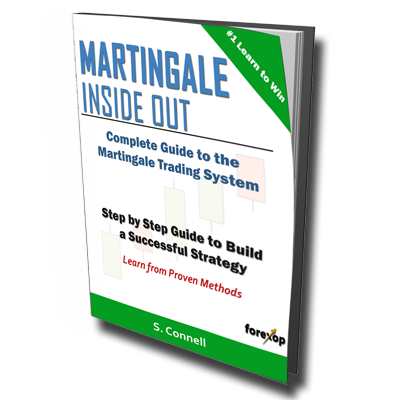 Tight stop losses can be set to close the position on all but the smallest pullbacks. But the disadvantage with that is that it can often mean missing out on larger profits if the market does fall more significantly afterwards. For an example of that take a look at the chart in Figure 4. There are a few ways to reduce this risk. The easiest is to split the order into several smaller trades (a grid) and only pyramid up the position if the market moves in the expected direction. Hey, I have a MT4 template that I think uses this same strategy. It gives more of reversal trends when 3 crows happen. I did not know how that worked and I figured it was the same strategy. Thanks for sharing it. I’ll make more use of this info.